Q: The DPRK said that the intercontinental ballistic missile (ICBM) it launched yesterday could carry a nuclear warhead. Does China believe that its claim is accurate? What is China's response to the claim? A: I gave my reply yesterday. The Chinese side has noted relevant reports. We are trying to get more information, following the developments of the situation and making the assessment. Relevant resolutions of the UN Security Council have explicit stipulations on launches conducted by the DPRK using ballistic missile technology. The Chinese side opposes launches by the DPRK in violation of relevant resolutions of the UN Security Council, and urges the DPRK not to violate relevant Security Council resolutions any more. In addition, the Chinese and Russian foreign ministries issued a joint statement on the Korean Peninsula issue yesterday in which the two sides expressed grave concern about the missile launch. Q: The joint statement by the Chinese and Russian foreign ministries yesterday called upon relevant parties of the Korean nuclear issue to avoid provocative actions and belligerent remarks and demonstrate their will for dialogue without conditions. Yet according to media reports, supreme leader of the DPRK Kim Jong-un said, the launch yesterday was a gift sent to the US on the July 4 anniversary, and the DPRK will not take the nuclear and missile programs as conditions for negotiation if the US does not change the hostile policy towards it. Does China think the situation on the Korean Peninsula may go out of control? Is there any way more effective in easing the tensions than peace talks? A: We said many times that the situation on the Korean Peninsula remains highly sensitive and complex. We hope all relevant parties can stay calm and exercise restraint, refrain from words and deeds that may heighten tensions, make joint efforts to ease tensions and bring the Korean Peninsula nuclear issue back to the right track of peaceful talks as soon as possible. I would like to say something more about the joint statement by the Chinese and Russian foreign ministries on the Korean Peninsula nuclear issue. The statement gives voice to the international community's aspiration for calm and dialogue instead of tension and confrontation on the Korean Peninsula issue, and reflects the common position and concern of China and Russia on the Korean Peninsula issue. Based on the "dual-track approach" and the "suspension for suspension" initiative proposed by China and the step-by-step conception by Russia, the statement sets forth a joint initiative of the two sides, which aims at solving the issue by addressing both the symptoms and root causes with a multi-pronged, comprehensive approach. It is objective, fair, reasonable and practical. We hope all relevant parties can make positive response to it and create a practical path for the settlement of the Korean Peninsula nuclear issue. Q: Previously you mentioned that the Indian side explicitly recognized on many occasions that the Sikkim section of the China-India boundary had been delimited. Do you have additional evidence apart from Prime Minister Jawaharlal Nehru's letter to Premier Zhou Enlai? A: Since the trespass by the Indian troops, we have stated China's stern stance many times. The fact is that the Sikkim section of the China-India boundary had been delimited by the Convention Between Great Britain and China Relating to Sikkim and Tibet (1890). Since the independence of India, the Indian government has repeatedly confirmed this fact. Since you asked for additional evidence, I can offer you more: In the note it sent to the Chinese Ministry of Foreign Affairs on February 12, 1960, the Indian Embassy in China said, "the Government of India welcomes the explanation given in the Chinese note relating to the boundary with Sikkim and Bhutan on the one side and Tibet on the other. The note states that the boundary between Sikkim and Tibet of China has long been formally delimited, and that there is neither any discrepancy on the maps nor dispute in practice. The Government of India would like to add that this boundary has also been demarcated on the ground." These contents in that note were all written down in black and white. What I want to point out is that the relevant actions of the Indian side have violated the purposes and principles of the UN Charter and trampled on international law and the norms governing international relations. It is known to all that in the 1950s, China, India and Myanmar jointly initiated the Five Principles of Peaceful Co-existence of "mutual respect for sovereignty and territorial integrity, mutual non-aggression, non-interference in each other's internal affairs, equality and mutual benefit, and peaceful co-existence". But to the astonishment of the international community, by illegally crossing into other's territory, India this time trampled the basic norms governing international relations championed by itself. If it fails to correct its mistake in a timely manner, how is it supposed to win the trust of its neighbors or play a bigger role in international affairs? We once again urge the Indian side to abide by the provisions of the boundary convention, respect China's territorial sovereignty, immediately pull all of the troops that have crossed the boundary back to its own side and properly settle this incident as soon as possible. Q: Will the Chinese government issue any security alert to Chinese citizens who work and live in India? A: The Chinese government highly values the security and legal interests and rights of the overseas Chinese nationals. We will issue relevant security alert in accordance with the security situation in relevant country. Q: Does China think the policies and remarks of President Donald Trump since he took office are to blame for the current tensions on the Korean Peninsula? President Trump said in Twitter that China should take more measures to stabilize the DPRK. Does China think what he said is just his wishful thinking or is it constructive in real terms? A: Just as I said, the situation on the Korean Peninsula remains highly sensitive and complex. We hope all relevant parties can stay calm and exercise restraint, refrain from words and deeds that may heighten tensions, make joint efforts to bring the Korean Peninsula nuclear issue back to the right track of peaceful settlement through dialogue and consultation as soon as possible. In a bid to solve the issue, China's contributions are there for all to see and its role is indispensable. Meanwhile, we hope that various parties can work for the shared goal and jointly bring the Korean Peninsula nuclear issue back to the right track of peaceful settlement through dialogue and negotiation. This requires our concerted efforts. Q: You referred to the letter from Prime Minister Nehru in 1959 endorsing the 1890 convention. In the same letter, Prime Minister Nehru also wrote that the Chinese maps show sizable areas of Bhutan as part of Tibet. He said the rectification of errors in Chinese maps regarding the boundary of Bhutan and Tibet has to be discussed between China and India. What is China's comment on that? In addition, Bhutan has also lodged a protest with China about Doklam area. Are there any talks going on between China and Bhutan in this regard? A: I am not aware of the specifics you mentioned about that particular letter and I need to verify them. 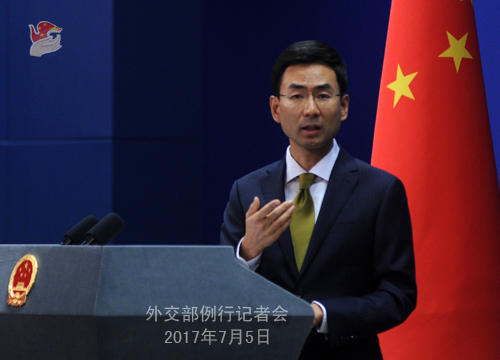 As to the boundary negotiation between China and Bhutan, we have repeatedly stated that Doklam has always been part of China's territory and under China's effective jurisdiction without disputes. China and Bhutan have held 24 rounds of boundary negotiations since they launched such talks in the 1980s. Though the boundary is yet to be demarcated officially, the two sides have basic consensus on the situation on the ground in the border areas and the boundary alignment. There is no disagreement on the fact that Doklam belongs to China. 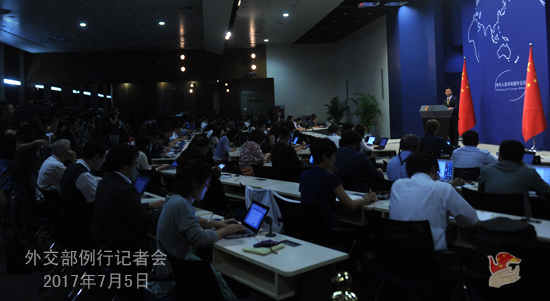 China has strictly observed the agreement between the two sides all along. The status quo of the boundary in the Doklam area is clear-cut, and the area has always been under China's effective jurisdiction. There is no breach of agreement or damage to status quo by the Chinese side, which I believe is clear to the Bhutanese side. China stands ready to work with the Bhutanese side to settle the boundary question through friendly negotiation without external interference and uphold peace and tranquility in the border areas. Q: When giving an interview to the Indian media, the Chinese ambassador to India said that peaceful settlement is only possible when the Indian troops withdraw unconditionally. What's your comment on this? A: We demand that the Indian side pull back the troops that crossed the boundary and create necessary conditions for the recovery of peace and tranquility in relevant areas. Chinese Ambassador to India Luo Zhaohui has explicitly expressed China's stance and requirement. Q: The ROK and the US carried out ballistic missile interception drills today. How do you comment on that? Does China have anything to convey at the Security Council emergency session to be held later today? A: Just as I said, the situation on the Korean Peninsula remains highly sensitive and complex. We hope all relevant parties can stay calm and exercise restraint, and refrain from any actions that may escalate tensions. All relevant parties know well the clear-cut position of us. As for the emergency session you mentioned, China will participate in the discussion in a responsible manner as a permanent member of the Security Council. At the same time, we also hope the relevant discussion will help resolve the Korean nuclear issue in a peaceful manner through dialogue and negotiation. Q:The Indian army spokesperson was cited by the Indian media as saying that the stand-off this time is not the longest since 1962. The Chinese and Indian militaries manage their relations very well. Moreover, Indian Prime Minister Narendra Modi said last month that not a single bullet has been fired in 40 years despite the Sino-Indian border disputes. How do you comment on that? Do you think the incident this time will have a serious bearing on China-India relations? A: On relevant remarks by the Indian side, I would like to point out that the settlement of the boundary question serves the fundamental interests of the two countries and is the strategic goal the two sides have been striving for. In fact, China and India have been exploring means to settle the boundary question through the mechanism of special representatives, while jointly taking measures to uphold peace and tranquility in the border areas. This time the Indian troops illegally crossed the delimited Sikkim section of the China-India boundary into the Chinese side. It is very serious in nature. China has lodged stern representations with the Indian side through diplomatic and border defense meeting channels. By far, the Indian troops still stay on China's territory, and the incident is yet to be resolved. 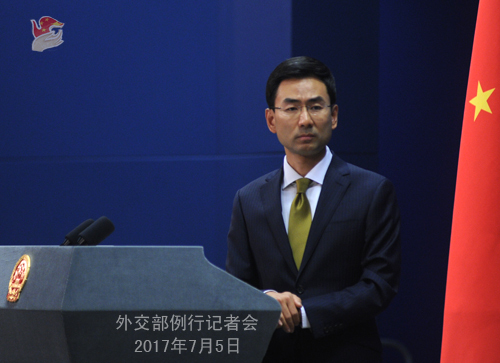 China reiterates again that India should immediately pull all of the troops that have crossed the boundary back to its own side. It is the precondition and basis to settle the current incident before it gets worse and has more serious consequences. We have noted that the Indian side stated many times previously that it highly values China-India relations and wishes to enlarge our mutual benefits and properly handle differences. We demand that the Indian side pull all of the troops that have illegally crossed the boundary back to its own side and correct its mistake with concrete actions, with a view to demonstrating sincerity for resolving the boundary question and developing China-India relations, and creating necessary atmosphere and conditions for the normal development of the bilateral relations. Q: The boundary talks between India and China commenced after the 1962 war at the China-India border, or more exactly, after Prime Minister Rajiv Gandhi's visit to China in 1988. Do you have any post-1962 document which proves that India recognizes Doklam as part of China's territory? A: We have repeatedly said that the Sikkim section of the China-India boundary has been clearly delimited by the Convention Between Great Britain and China Relating to Sikkim and Tibet (1890). This convention is recognized by both China and India, and the boundary at the Sikkim section has been delimited. This time the Indian side crossed the delimited boundary at the Sikkim section, which is a very serious incident in nature. 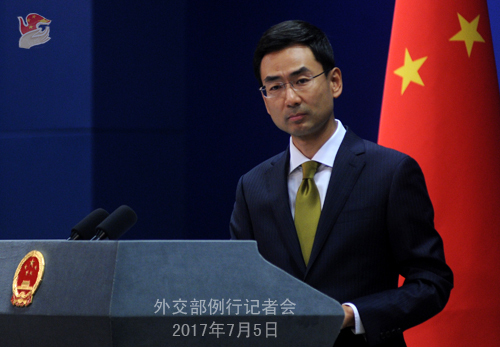 China has been in contact with India for the settlement of the boundary question through the meeting mechanism of the special representatives. But what happened this time goes against the spirit upheld by the mechanism and is inconsistent with the previous efforts the two sides have made. We again urge India to withdraw the border troops to the Indian side of the boundary and demonstrate the sincerity to resolve the boundary question and develop China-India relations with concrete actions. Q: Is there any specific mention of the tri-junction in the document in which India recognizes China's sovereign over the Doklam area? Is the Doklam area located in the tri-junction? A: On the tri-junction, the 1890 Convention stipulates that the Sikkim section of the China-India boundary commences at Mount Gipmochi in the east. The illegal trespass by the Indian troops took place at the Sikkim section of the China-India boundary over 2000 meters away from Mount Gipmochi and has nothing to do with the tri-junction. The Indian side, in disregard of the boundary convention, takes the whole Doklam area as part of the tri-junction. This is obviously an attempt to confuse the public out of ulterior motives.